"one of the finest of his generation, an underrated giant waiting to be discovered." Book and CD: "Trombone Technique Through Music"
A longtime fixture on the New York, SF Bay Area, European and now Los Angeles jazz and classical scenes, Neumeister has been composing and leading his own groups since 1978. As a trombonist, Ed performed for 15 years in the Duke Ellington Orchestra, 19 years with the Mel Lewis Big Band (which during Neumeister's tenure became the multi Grammy-nominated Vanguard Jazz Orchestra). 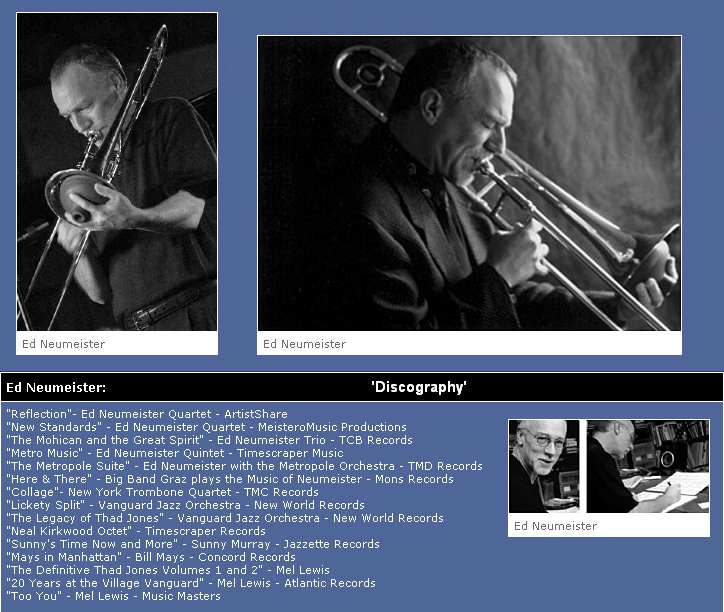 Neumeister has also performed and recorded with artists ranging from Jerry Garcia to Gerry Mulligan. As a "classical" player, he has performed with the New York Philharmonic, San Francisco Symphony, San Francisco Ballet and many other classical orchestras. Since 1992, Ed has been touring extensively both as a soloist and as a leader of his own Quartet and The NeuHat Ensemble. Neumeister has recorded seven albums as a leader including modern big band, trombone quartet, chamber trio, jazz quartet and quintet as well as a Concerto for Cello and Big Band. The Metropol Orkest (Netherlands), Hamburg Radio Big Band (Germany), Maribor Opera Orchestra (Slovenia), Vanguard Jazz Orchestra (New York), Milky Saxophone Quintet (Paris) and Sophisticated Ellington Project (Tokyo). He has received three grants from the National Endowment for the Arts, a grant from the Aaron Copland Fund and Commissions by, the American Society of Composers, Authors, and Publishers (ASCAP), International Associate for Jazz Education (IAJE), and a Grammy nomination. Neumeister is the founder of the NeuHat Ensemble in New York an 18-piece hybrid ensemble fusing 21st century classical, jazz, funk and freely improvised music with musicians of equally diverse backgrounds and ENJO (Ed Neumeister Jazz Orchestra) in Los Angeles. Neumeister is one hell of a trombonist, and design-wise, his solos are fanciful reveries (check that mute work on "The Peacocks") that nonetheless boast a steely logic. "The Trombone in Neumeister's hands pushes beyond recognized limits. He hits registers and tones way beyond the instrument's comfort zone, and his lines often abandon melodic logic for a daring grasp at intuitive exposition"